Today UI 2.0 and I take on Buddy Complex with the discussion-style review we popularized with the Golden Time review earlier this week. As opposed to Golden Time, we actually managed to agree on most points. So come join us as we explore the Sunrise mecha show Buddy Complex. UI 2.0: Buddy Complex is a scifi mecha anime produced by Sunrise. The story follows Aoba Watase, who gets pull from his ordinary high school life and travels 70 years into the future. He quickly finds himself in a middle of a war, piloting a mecha, and many unanswered questions. 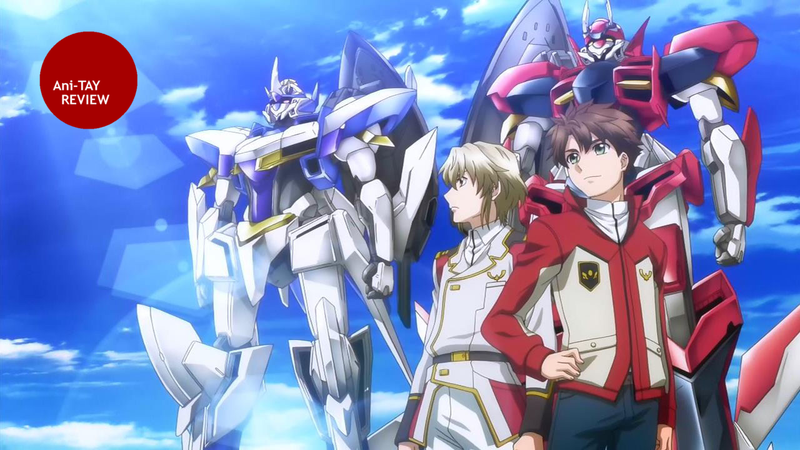 Dexomega: In comparison to more recent Gundam anime offerings from Sunrise, this one is geared less toward selling models and more toward a more traditional mecha show. While not as dark as older Gundam shows by any means, it is almost certainly geared more toward the audience that previous Gundam shows held. Dexomega: When I first started Buddy Complex, I wasn't very impressed really. The early episodes weren't that good and the story was passable, but nothing to look at. Now that I look back on it though, it actually managed to be a lot stronger than I initially gave it credit for. UI 2.0: Same here, I am loving the story despite being skeptical at the first episode. There wasn't anything about the first episode that really grabbed me other. Since I'm a time travel fan, that was enough to give me reason to press on. Dexomega: Generally speaking, it follows the exact same Sunrise plot that we usually get in the first 25 episodes of many Gundam shows. The protagonist is on a ship, there's an enemy ship, and our ship is running away from them. This leads to a bunch of episodes that equate to the main characters defending the ship from increasingly stronger enemies. In that way, I guess it's bad, but as I said, it's stronger than I initially gave it credit for. UI 2.0: I don't about you, but I'm getting a very Gundam Seed vibe from the show or at least the early episodes since I've never finish Seed. Dexomega: Oh yes, I definitely felt the SEED vibes. I nearly mentioned how it channels Mobile Suit Gundam and Gundam SEED just up above! Dexomega: That's especially amusing since you could say the same thing about Kakumeiki Valvrave, another recent Sunrise show. UI 2.0: Haha, the only difference is, no space. Everything is over land and sea. That and a touch of time travel. Dexomega: Indeed. Even with it's relatively simple plot and relatively familiar story line, it still managed to do more than I expected it too. It was a very watchable story in a season that is having a LOT of problems with good stories. UI 2.0: Season 1 so far has not disappoint, I can only hope Sunrise keep the story up and not turn it into a disappoint like Valvrave. Dexomega: I can agree to an extent. If they can keep it together, it might be one of the better mecha shows in recent memory, even better than Valvrave (which I enjoyed as a massive camp-fest mind you). UI 2.0: I've enjoy Valvrave up until the end. The ending just miss the mark since it felt extremely rush. Is there anything else you would like to add about the story? Dexomega: I think that's about everything. Surprisingly strong in a season that's having a lot of trouble with good stories. UI 2.0: Haha, Buddy Complex is the anime that caught me by surprise. Let's move onto characters. Dexomega: Much like the story, I started out disliking the overt simplicity of... err... everyone. But they grew on me. UI 2.0: Yup, even Dio. The Mr. Grumpy of the show. Dexomega: Buddy Complex plays so many mecha show tropes straight, even mecha tropes that have been falling out favor like a "Type 1 Eagleland", where the United States-expy country is just inherently "good". It's so optimistic and fun-loving sometimes that it's just charming. That goes for the characters too, they're a fun bunch that you'll eventually like because they AREN'T brooding teenagers for once. Well, sometimes they brood, but it's not that bad. UI 2.0: Haha, yeah. I think that's the biggest difference between Buddy Complex and most mecha anime. Despite having all the tropes, the characters are optimistic and generally positive. Which is refreshing. Dexomega: The bottom line with me when it comes to the characters is: Yes, they are tropes. They are the same tropes we've seen from mecha shows by Sunrise before. You've got the idiot-ball holding protagonist, the badass "Atoner" character (Dio), the bridge bunnies, and the cool captain, but I honestly didn't care. I was having way too much fun in the show to notice the flaws by the half-way point. UI 2.0: Yup, and it helps that the show doesn't bring in too many horror of wars, politics and all those other drama into the story. It gives more room for the characters to joke and do what they need to do without overcomplicating everything. Dexomega: Absolutely. Gotta love mechs. Dexomega: From a design standpoint, I thought the coupling valiancers (good guy super prototype mecha) were pretty cool. Yup, the Zogillia Republic got more taste when it comes to design with their vailancers. Dexomega: Alright, let's be honest, much like Valvrave's Dorssia, everything Zogillia does is more fabulous. Dexomega: You're right though. The Free Pact valiancers are pretty boring and I can't even describe them to you. I don't remember them. The Coupling valiancers do manage to look pretty cool though. UI 2.0: Haha, yes. The show makes Free Pact Alliance look broke. They've got a few generic mechas, and constantly outnumber. If it wasn't for Luxon and Bradyon, the show probably would have ended by episode 2. Dexomega: The fact that the Free Pact generally appears to be defeated at everything does give the Luxon and Bradyon plenty of chances to show off their awesome though. We should just name them curbstomp machines and save ourselves some time. UI 2.0: For sure, what do you think of the coupling system? Personally, I think it's really neat and different than using the generic super ace pilot character. I love how it links both pilot brain processing together. Dexomega: Much like everything else, we've seen this concept before and it's not realistic in many ways, but it was too awesome for me to care. Damn they look so cool in coupling mode. Dexomega: Wait, are we going to curbstomp TAY now? UI 2.0: hahaha, nah, GBD is still much too powerful. We need to do a few more reviews before our user progression is high enough to take him down. Dexomega: Alright then. Your final verdict on these mechas fellow mecha lover? UI 2.0: Overall, nothing too special but the Vailancers help the overall designs from being too boring. Dexomega: I thought they were above par due to the raw awesome of the Luxon and Bradyon when they really get going. Most of the rest of the mecha designs fluctuate around the board though. UI 2.0: Oh man, Luxon and Bradyon Coupling Form is pretty sweet though. Alright, let's move onto Soundtrack. UI 2.0: I enjoy the ending credit song. The opening was okay. But nothing really stood out to me throughout each episode. Dexomega: The soundtrack is limited and there aren't many songs in general, but the battle music they have oozes an epic feeling. Couple the battle music with the animation and the mecha battles and you've got the reason I stayed with the show in the early episodes. UI 2.0: The battle music felt pretty standard to me. But the fight animation were nice. Ah, since you've mentioned animation, we need to talk about the animation. Dexomega: Sure. The overall soundtrack isn't much to look at, but it has its moments. Dexomega: So if you have nothing to add to that, we can talk about the aforementioned animation. UI 2.0: On to animation, overall, it's very similar to Gundam Seed. For some reason, the character animation for Hina really stood out to me. Her design and animation always seem soft and gentle compare to everyone else. As for battle animation, the coupling form is nice. Lots of zipping lights and explosion. Can't have a good mecha anime without those. Dexomega: The animation has some of the best flow I've seen in a mecha show to date. The battles flow very well and they're always a treat to watch. Sunrise was really showing off with this one. UI 2.0: Yup, one of the things I look forward to with each episode is when they use the coupling system. It's beautiful. Dexomega: The characters themselves are pretty good like you mentioned. There isn't much detail, but like the battles their movements flow rather well. Dexomega: Altogether, I think the animation of this series beats the par set by many mecha shows with it's excellent high-octane action and consistent nature. There weren't many instances of animation bump anywhere, it generally all hit the same level of quality. UI 2.0: Oh definitely, the animation is consistent. It also helps that the scale of the battles are a lot smaller than the battles in Gundam. This allows more focus on the few that are on the battlefield. Dexomega: The limited number of mecha on the battlefield helps the animation costs quite a bit I'm sure. You're right on that note as well. UI 2.0: Yup, the animation primarily focuses on Luxon and Bradyon, as well as the enemy mecha during the fights. 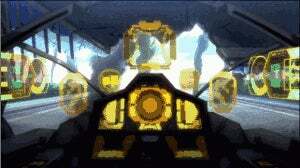 Ally mecha are hardly shown and if so, it's usually inside the cockpit or from a really far distance with the protagonist standing out. Dexomega: It might make us sad in the mecha category, but we're certainly happy here. UI 2.0: Yup, for a non-gundam show, I certainly don't expect Sunrise to allow a bigger budget, so something has to give. Dexomega: So, fine animation all around. I think we've got this category discussed pretty thoroughly, should we move on? UI 2.0: Yup, on to the ending. Dexomega: The winter season has been a season of lackluster endings, at least in my opinion, so Buddy Complex surprised me a lot by having at least a passable ending. UI 2.0: Yup, but still doesn't top Kill la Kill's ending for me. I do enjoy the twist at the end despite leaving a huge cliffhanger for season 2. Dexomega: Yeah, that twist kinda caught me off guard. I hadn't considered that particular possibility when it came up. I always was just assuming that it was a disjointed time loop akin to something like "Terminator" rather than what it turned out to be. UI 2.0: But one thing does leave me wondering, how old is that pin? She keeps repeating herself until now. Dexomega: Haha, well one has to question where it came from and when this all started in the first place if we start digging deep like that. UI 2.0: For sure, it's one of those things you've just got to accept with time travel story. There's always a paradox or unanswerable question. Despite that, I still think the time travel element is done well and the ending does open Aoba and Hina's future to more possibilities. Along with Dio, but he's clearly the third wheel in this whole relationship. Dexomega: They chose not to make time travel an element of the plot and they instead chose to make it a way to frame the plot. That was the exact RIGHT thing to do. Too many times I've seen time travel shows immediately go to the "Time travel machine" arc. Here though, Aoba is a guy that just somehow got thrown into the future and he has a strange temporal relationship with Hina. It's far less about time travel and far more about just showing these three completely different people interact. UI 2.0: I agree, Aoba is just the guy from the past, and Hina is the anomaly. Outside of that, the focus is on who they are as a person and how they handle that fact rather than finding an explanation about themselves. Overall, I like the ending, but since Buddy Complex is planned for another season, the ending is still incomplete and I'm definitely looking forward to the conclusion for the series. Dexomega: Indeed. Even as a season ending, I was surprised quite a bit by how strong this show ended. It's one of the better ones out of the season and actually anticipate the next season quite a bit. UI 2.0: I think it's safe to say we can come to a conclusion about the show. Anything else you like to add before the final verdict? Dexomega: I think that's about it for me. We can segue right into the conclusion. Dexomega: The winter season was a mixed season at best. Even the best shows were having problems with their drama and endings. As if sensing my discontent, Buddy Complex became my go-to show for consistently fun, yet surprisingly well-written drama. It has great animation, a good soundtrack, and the ending was above par for this season. I think it's one of the better shows of the season. UI 2.0: Buddy Complex is worth a watch, especially for a mecha fan. 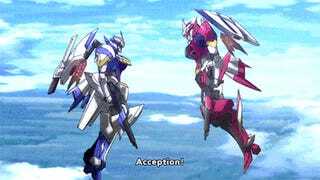 While the mecha design have room for improvement, the animation is top notch and the battle flows really well. In contrast to most mecha show, the characters retain and often have an optimistic outlook despite being in a war which is most welcome in my book. While, there are a lot of mecha anime tropes, the show isn't bog down by the tropes and often keep moving forward. Overall, the anime is a surprise hit in my book despite a slow start. It hit me the other day, the coupling system reminds me of Pacific Rim, except for the fact that each pilot gets their own awesome mecha. Dexomega: Indeed, it's a mecha show that just has fun with its tropes and still manages to blaze a good trail with its plot. I peg it as a hands-down "Go For It" if you have ever enjoyed mecha shows. I also noticed the similarities between drifting and coupling by the way. They aren't too similar, but it's amusing. UI 2.0: Definitely a "Go For It" in my book. Dexomega: Haha, we agree. Considering how everyone wrote off Buddy Complex, this is especially amusing. UI 2.0: Such a shame, they've missed out on something that's quite enjoyable. Dexomega: Yes, so take it from us guys, this is a great watch for the mecha fan.